I’m here now in the kitchen. We have big space there for preparing the foods for the people. Look at those man working there. It’s not easy to prepare and cook food for more than 12,000 people. But with all the efforts and coordination of everyone, I’m sure that everybody will enjoy their lunch tomorrow. This is just the start of this cooking activities. We cook there enough food for the whole. After this, I will go to other place and I will take a picture there and render also my help. I want everything in place when the prayer function will begin. Today I’ll be going to Matar. I will check there what we will be needed for the preparation of tomorrows big event January 30, 2009. We will have our “Universal Peace Prayer”. That is something which should be given importance. I will see to it that everything there will be available. I will make sure that the kitchen there will have all the materials that will be using for the preparation of the food. 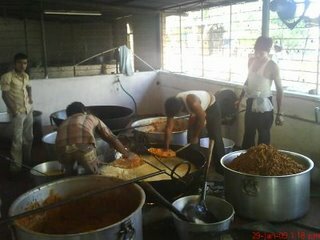 We will be preparing lunch and we are going to feed more than 12,000 people who will go there. It’s just only my estimation of how many people will go there. I’m sure many will attend to that prayer function. So it’s not easy to prepare foods with only few people. I know everybody will contribute their effort for the wellness of that function. Everybody who will go there today will be busy with their own work. The preparation is not easy. With the cooperation of each and every one, the work will be done simultaneously. We will have something for the kids too. They will be given chocolates and candies there. Kids will love all the activities there. At the same time, while they are still young, they will be aware of what is the importance of praying. And this should be known by many specially our children. I will be taking pictures today and specially tomorrow. I will publish some of that. I will be going now there and hope that you will be following me till our tomorrow’s special day. I will be waiting for you all there and be our guest in our prayer function.